0030. AMRC Collection, Williams Afghan Media Project, Williams College, Williamstown, MA. 26-13. AMRC Collection, Williams Afghan Media Project, Williams College, Williamstown, MA. Albright, Senior Airman Rylan, and ISAF. "Looking Out in Afghanistan." Digital image. Isafmedia's Flickr Photostream. Accessed September 5, 2010. http://www.flickr.com/photos/isafmedia/4737768883/. Arnesen, Marius. "Gunnar Trying a Burqa - Herat, Afghanistan." Digital image. Marius Arnesen's Flickr Photostream. Accessed September 5, 2010. http://www.flickr.com/photos/anarkistix/4112252824/in/[email protected]/. Batoor, Barat Ali. ""Kite Runner" in Kabul: 14 September 2009." Digital image. UNAMA's Flickr Photostream. Accessed September 5, 2010. http://www.flickr.com/photos/unama/3919091655/in/photostream/. Bluuurgh. "Taliban-Torkham-2001." Digital image. Wikipedia Commons. Accessed September 5, 2010. http://commons.wikimedia.org/wiki/File:Taliban-Torkham-2001.jpg. Collet, U.S. Army Spc. Jeff, and ISAF. "100308-A-9647C-113." Digital image. Isafmedia's Flickr Photostream. Accessed September 5, 2010. http://www.flickr.com/photos/isafmedia/4534100118/. DING, Dawei. "GB2767_18." Digital image. Daweiding's Flickr Photostream. Accessed September 5, 2010. http://www.flickr.com/photos/[email protected]/4035703439/. Dupree, Nancy. 80-655. Dupree Collection, Williams Afghan Media Project, Williams College, Williamstown, MA. Fekrat, Nasim. "Hazara Woman." Digital image. Afghan LORD's Flickr Photostream. Accessed September 5, 2010. http://www.flickr.com/photos/sohrab_kabuli/2814898600/. Geo Swan. "Taliban Fighters on a Pickup Truck." Digital image. Wikipedia Commons. Accessed September 5, 2010. http://commons.wikimedia.org/wiki/File:Taliban_fighters_on_a_pickup_truck.jpg. Huffman, Todd. "The Road." Digital image. Todd Huffman's Flickr Photostream. Accessed September 5, 2010. http://www.flickr.com/photos/[email protected]/3819504701/. Lambert, Olly. "Kabul Football Stadium." Digital image. Olly L's Flickr Photostream. Accessed September 5, 2010. http://www.flickr.com/photos/ollylambert/423940195/. Logari, Durai. "More Nare Kele." Radio-Television Afghanistan Archives. McNeeley, Mass Communication Specialist Chad J., and U.S. Department of Defense. "100330-N-0696M-108." Digital image. Chairman of the Joint Chiefs of Staff's Flickr Photostream. Accessed September 5, 2010. http://www.flickr.com/photos/thejointstaff/4476752207/. Millucci, Barbara. "Afghanistan - Red Cross -." Digital image. Barbara Millucci's Flickr Photostream. Accessed September 5, 2010. http://www.flickr.com/photos/[email protected]/2168691015/. Montgomery, Carl. "Darulaman Palace, Kabul Afghanistan, a Little Rocket Weary." Digital image. Carl Montgomery's Flickr Photostream. Accessed September 5, 2010. http://www.flickr.com/photos/carlmontgomery/3068050936/. "Phonograph Record Store." Digital image. Foreign Policy. Accessed September 5, 2010. http://www.foreignpolicy.com/articles/2010/05/27/once_upon_a_time_in_afghanistan. Q-00492-19. AMRC Collection, Williams Afghan Media Project, Williams College, Williamstown, MA. Stone Upon My Soul (Russian Propaganda Film Showing Soviet Withdrawal from Afghanistan). Restored by Gregory Whitmore. Williams Afghan Media Project, Previously Unpublished. Tabios, Petty Officer 1st Class Ryan, and ISAF. "090912-N-1175T-099." Digital image. Isafmedia's Flickr Photostream. Accessed September 5, 2010. http://www.flickr.com/photos/isafmedia/3960898469/. Unknown. "020114-N-8242C-005." Digital image. Defenseimagery.mil. Accessed September 5, 2010. http://tinyurl.com/2ehm5j7. U.S. Navy, and ISAF. "Taliban Use Mosque to Hide Weapons Cache." Digital image. Isafmedia's Flickr Photostream. Accessed September 5, 2010. http://www.flickr.com/photos/isafmedia/4850775420/. Waezi, Fardin, and UNAMA. "Attack in Kabul: 18 January 2010." Digital image. UNAMA's Flickr Photostream. Accessed September 5, 2010. http://www.flickr.com/photos/unama/4284056235/in/photostream/. For people who know Kabul, it’s hard to reconcile what life is like today compared to 50 years ago. When the Soviet Union withdrew its troops, it also withdrew its financial and infrastructural support to the Afghan government. The Afghan government—unable to provide for its people—quickly lost credibility. Various warlord-led militias grouped outside of Kabul, vying for power. It wasn’t clear whether the government was trying to hold things together, or if it was ripping itself apart by participating in factional fighting. In the power vaccuum that resulted, no one was left to protect the capitol city of Kabul. Fierce gun fights and rampant missile strikes, spiraled downwards into abject rejection of wartime conventions. Hospitals were bombed, the Red Cross targeted, civilians killed. By the time the Taliban arrived in Kabul in 1996, their numbers far outranked most of the other factions. The Taliban chased the warlords out of Kabul. The people who were left in Kabul cheered the Taliban liberators and welcomed a return to relative peace. But cheering was replaced by despair all too soon. The Taliban had a very particular and narrow interpretation of sharia, the Islamic law. Cultural artifacts were destroyed because they were anti-Islamic in the eyes of the Taliban. Music was silenced. Shiites and Hazaras were persecuted and many were slaughtered. All men were commanded wear beards and a head covering and live by a strict code of conduct. Women had to wear burqas and were not allowed to work or have an education. Seemingly innocent past times were punishable by public flogging, mutilation, or worse. Life, as Afghanistan had known it, had changed radically. The people were persecuted by harsh laws and even harsher punishments. Muslims around the world argued that the practices in Afghanistan were a desecration of the sharia. But in Afghanistan, there was no room for debate. After the fall of Kabul, the Taliban went on to control an estimated 95% of Afghanistan by September 2001. 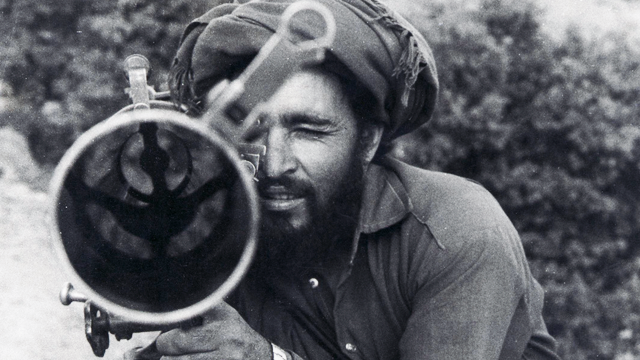 Taliban rule, following a quarter century of fighting, had all but destroyed Afghanistan. The chaos that resulted harbored an international terrorist movement that would lead Afghanistan to war with a faraway, but very powerful nation. The civil war between the Northern Alliance and Taliban attracted international attention.